﻿﻿When amputees receive powered prosthetic legs, the power of the prosthetic limbs needs to be tuned by a prosthetics expert so that a patient can move normally - but the prosthetic often needs repeated re-tuning. Researchers have now developed software that allows powered prosthetics to tune themselves automatically, making the devices more functionally useful and lowering the costs associated with powered prosthetic use. The research was published in the journal Annals of Biomedical Engineering. "When a patient gets a powered prosthetic, it needs to be customized to account for each individual patient's physical condition, because people are different in size and strength. And that tuning is done by a prosthetist," the researchers said. "In addition, people are dynamic - a patient's physical condition may change as he or she becomes accustomed to a prosthetic leg, for example, or they may gain weight. These changes mean the prosthetic needs to be re-tuned, and working with a prosthetist takes time and money." 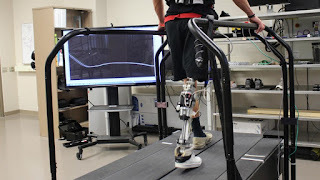 To address this problem, the researchers developed an algorithm that can be incorporated into the software of any powered prosthesis to automatically tune the amount of power a prosthetic limb needs in order for a patient to walk comfortably. The algorithm would not only make it easier for patients to walk while reducing prosthetist-related costs, but would also allow a prosthesis to adjust to changing conditions. The system works by taking into account the angle of the prosthetic knee while walking. Powered prosthetic legs are programmed so that the angle of the prosthetic joints - the knee or ankle - while walking mimics the normal movement of the joints when an able-bodied person is walking. During the conventional prosthetic tuning process, a prosthetist adjusts the powered prosthesis's system so that it exerts the power necessary to recreate those normal joint motions while walking. But changes in a person's weight, or gait, can affect the prosthesis's ability to achieve that "natural" joint angle. The automatic-tuning algorithm takes a similar approach, tracking the angle of the prosthetic joint while walking. But it is able to adjust the amount of power the prosthesis receives in real time, in order to maintain the proper angle. While the algorithm performed better than prosthetists at achieving the proper join angles, the researchers need to improve the technology further. They are still not able to replicate the prosthetist's success in achieving the 'trunk motions,' to help patients maintain a comfortable posture while walking. Based on material originally posted by North Carolina State University.